Do you ever really “get over” having a special needs child? Well those are words I’ve heard and I am comfortable sharing my thoughts and experience. I think the answer is “NO” and I think anyone that expects you to probably has never experienced pain and frankly are a negative influence in your life. Do you think anyone gets over the death of a child, spouse, parent… Well, for me it’s like I had two children. One child I grieved and put to rest and the second one who I love more than anything in the world. When you’re pregnant you start to make these expectations up in your head, plans for your child… well when I grieved, I grieved those dreams and expectations to rest. I now have new ones and I love the new ones. But will I ever “get over” what happened and the heartache Kyle and I experienced? Probably not. Can I “get over” my daughter has been to the ER 33x’s and hospitalized 7x’s? I frankly think that is unfair of one to ask—especially someone that didn’t experience the roller coaster and still the many unknowns. What I have learned is to cope (new way of thinking) and a new normal for my family. I had a friend call me and tell me one of her good friends just found out their child is special needs and what should she do for her friend. I’m a huge believer that we all deal with situations differently. I don’t believe one is right or wrong. 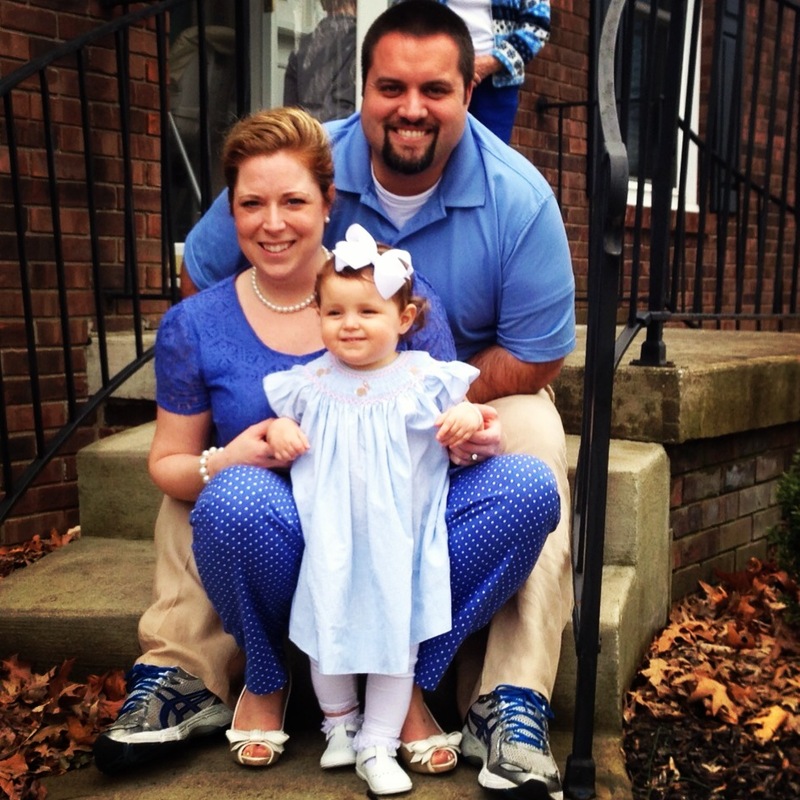 I’ve learned that thru having Reese—Kyle and I from the beginning have handled it differently. Again, no right or wrong but what I do believe is other’s should respect the differences in how you handle situations. The most important thing I had going for me is a ton of people praying for me. The devil was already heavily at work on me because he saw an opportunity in which he thought he could win me over but I had too many people praying, praying. I had a few close friends continually text, call and write bible verses all over my house—not giving up on me. Even on those days I didn’t want to get out of bed (that was during the grieving stage). I found others who had a special needs child that I could talk too. Our situations may have been different but it was someone I could talk to and have a same level of understanding. I finally accepted it. Did I “get over it” no because it’s something that faces me every single day. If you know someone is hurting DON’T tell them to get over it. But DO send them a card, pray for them, pray with them, take them a meal… do something that reflects the grace of God. One thing I’m so thankful for is being able to be open and honest with my girlfriends. I’ve told them do not cut me off from what your kids are doing. I want to know! I remember spending a long period of time worrying that my friends would cut me off because I had a special needs child. My mom told me—you’re not giving them a chance. She was right. 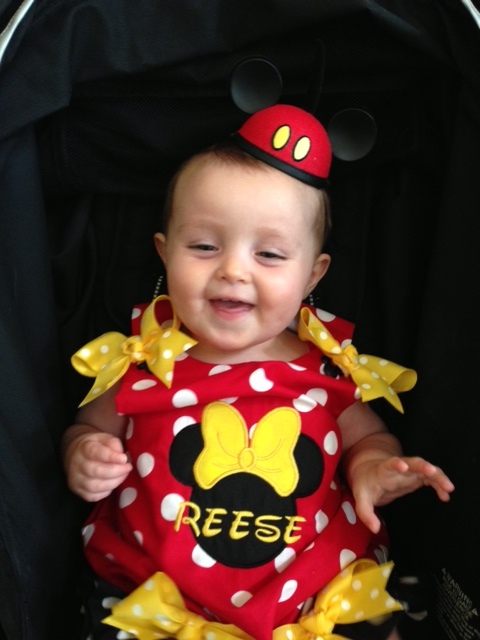 I’ll never forget the day one of my friends said, “I want my daughter to know Reese as Reese and love her”. That made my heart melt because I knew she wasn’t going to teach her daughter—Reese is “special needs” but Reese is Reese and fearfully and wonderfully made. Special needs doesn’t define Reese or my family. I have people tell me they didn’t ask us to do something because it was this or that environment. Kyle and I will make those decisions but ask–don’t cut us off because you think… what’s awesome is we will make those decisions for Reese. Reese is doing extremely well and we are thankful. Many people ask me “well isn’t she doing better than they thought”. I know this is meant with all good intentions… but there isn’t enough research to truly indicate she is doing better than what they thought. 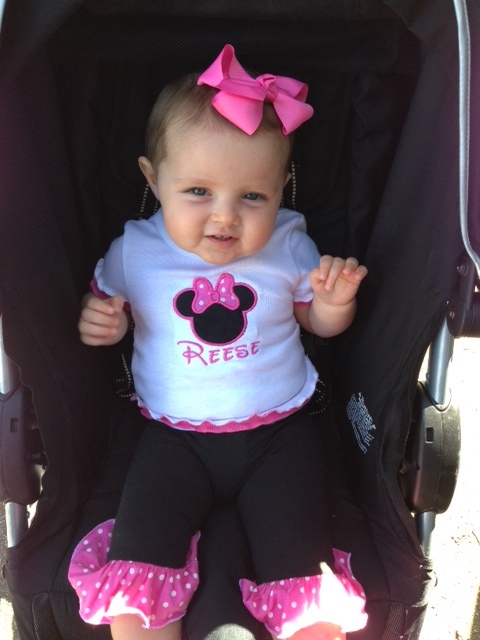 Reese has a “ trans-location” of her chromosome (the worse case scenario)…. We were handed a study of 4 girls. The oldest was 8 years old walked, one died at age two and chances are 50% of declining and having seizures as they get older. So they/we don’t know. What I do know is Reese is an amazing gift from God that has humbled me. What I do know is I cannot imagine my life without Reese McClain. 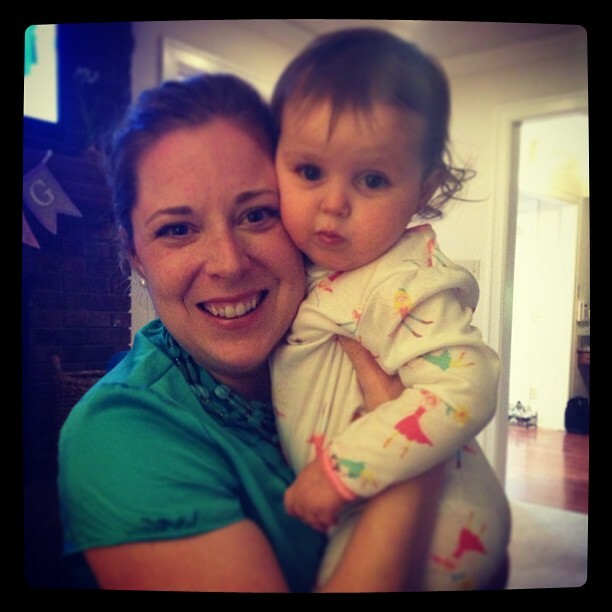 What I do know is Reese is teaching me to grow/nurture the relationships that mean most to me. And lastly, that we aren’t guaranteed anything… live/love/respect/give to others like it’s your last day! Love this picture of Ruby & Reese because Reese is looking at Ruby like what are you doing in my chair! 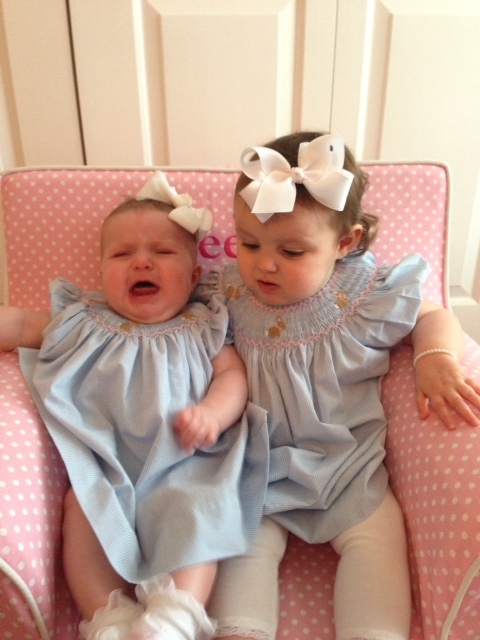 It was either Ruby or Reese crying on Sunday… they are my two precious little girls! 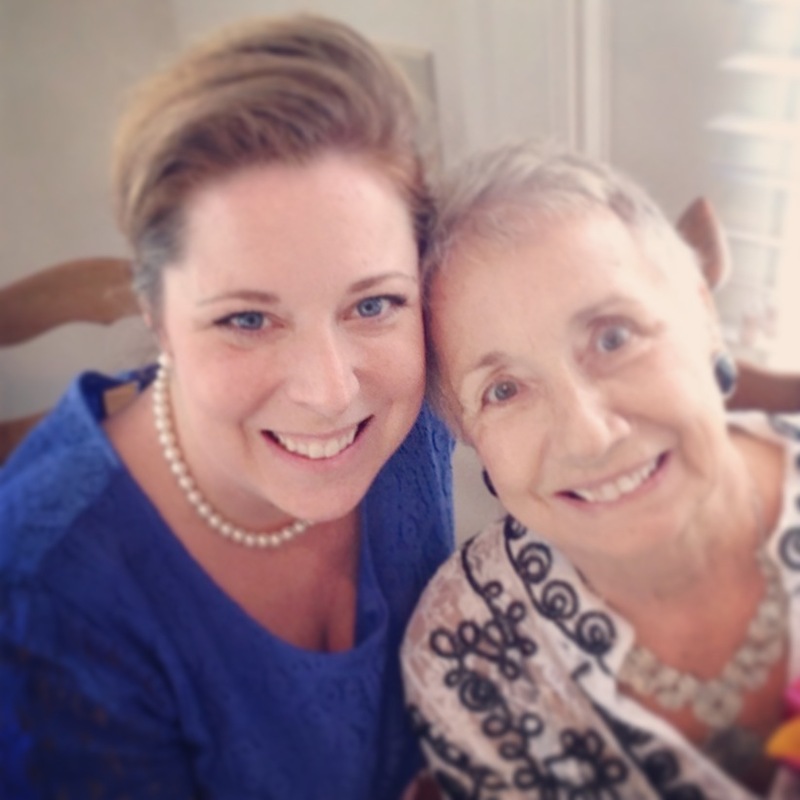 Please continue to pray for my grandmother (Judy) she is battling pancreatic cancer. She has A LOT to do with the woman I have become–strong, determined, independent … this list could go on for days! I am charged guilty with sometimes becoming consumed with the secular world’s Easter and not the TRUE meaning of Easter. 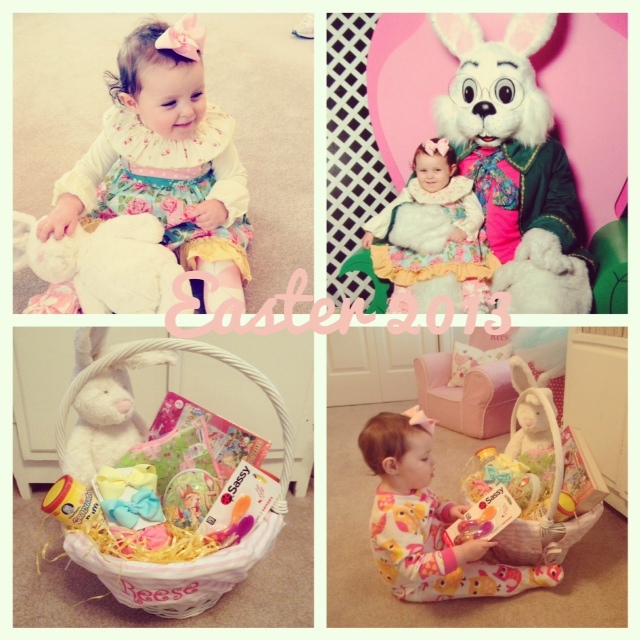 Reese’s Uncle Chase and girlfriend Whitney got Reese a book that tells the true story of Easter! I was so thankful to have that and read with Reese because it was a good reminder to me as well. You can’t avoid the word Death at Easter… are you ready? I cannot wait to walk the streets of pearls and gold–kissing the feet of my heavenly father! Above are two of my favorite quotes from the famous Christian theologian Dietrich Bonhoeffer. I’m currently reading the amazing biography “Bonhoeffer: Pastor, Martyr, Prophet, Spy” by Eric Metaxas. Bonhoeffer’s life is absolutely fascinating and his last days on this earth at the end of Nazi Germany are legendary chapters in WWII history. This book has got me thinking and reflecting…..
Today Reese had her tonsils and adnoids removed. Everything went great! Because of her medical issues, they’re keeping her under observation in the ICU for at least tonight. Staying tomorrow night is still currently up for debate and it will be decided in the morning with the doctors. I’m pulling the night shift tonight and it’s currently 2am. As I sit here reading the biography on Bonhoeffer, I couldn’t help but reflect the evil of this world that he confronted and all of us confront everyday. On each side of my daughter are two children that are less than 6 months old. One has a trach tube in her neck. The other is hooked up to more machines than I ever thought possible. In fact, the amount of machines is almost overwhelming to even look at. Every bed in this ICU is full and it stays like that constantly. Anyone can walk into this ICU and ask God why? Even a strong believer in Christ could ask why. It’s THE question so many believers and non-believers have. Why is there suffering in this world. Why has God allowed it? The fall of this world began in Genisus Chapter 3. Sin entered this world and has consumed it. God has allowed it for reasons we don’t always understand. The one reason we do understand is Jesus. God showed us his glory by sending his only son to die on the cross for us. His ultimate grace lies in his son. Whoever should believe in him shall have eternal life. Tomorrow or the next day my daughter will go home. Her scars will heal like they always do. She will go back to her therapies, her play time, and her yummy food. 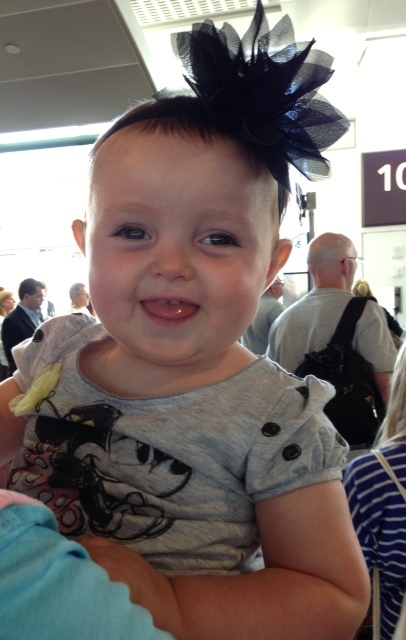 She will get many kisses from everyone and her smile will light up every room. Her future is unknown but the odds are, she will be back at this hospital again someday. We all at some point cry out why and God hears those cries. He sent his child to take our place on the cross. The evil of this world can be washed away by the blood of Christ. Do you know Jesus? Have you confessed your sins to him and and asked for forgiveness? Do you want to someday leave this evil world and live for eternity in heaven? Right now I’m surrounded by good and evil, life and death. God’s grace and love is what gets me through these times. I could focus on the evil and let it consume me or I can focus on Jesus. He really is the answer. Wow, I just noticed we haven’t posted on this blog in over a month! How time flies when you’re having fun. Below is just a quick thanks to everyone and what is next in our journey with Reese. 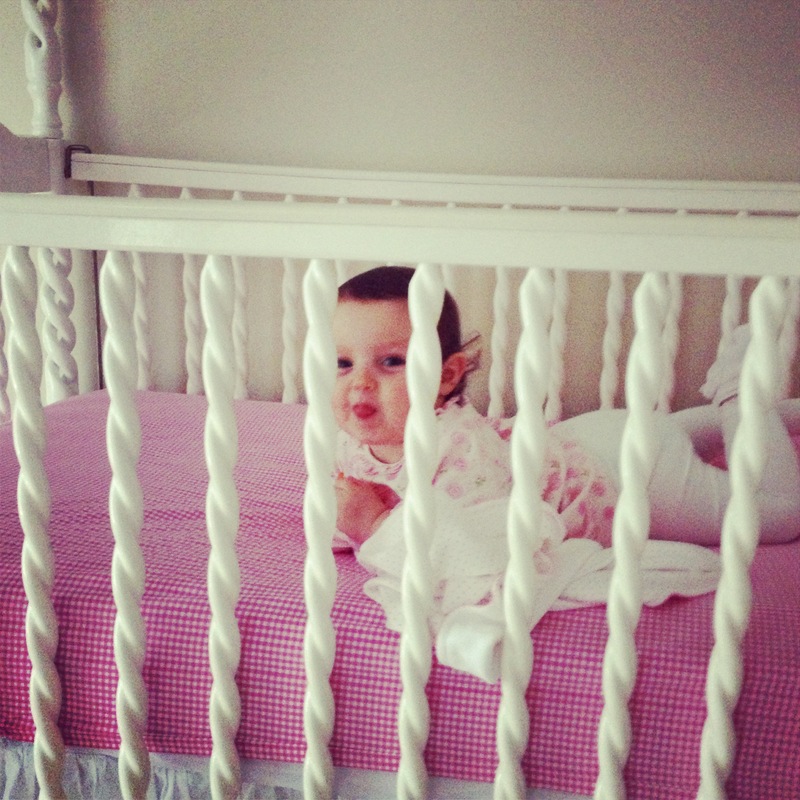 But first a recent picture of our adorable little girl right when she woke up from a nap. Her smile is infectious! Is it that time of year or what? It seems like everyone is sick. My work looked like a ghost town a few weeks ago as everyone kept passing the same bug around. Also, for a few weeks, the flu was in a full blown outbreak and the ER waiting rooms looked like the line for Splash Mountain. All of this will make parents of medically fragile children sit on the edge of their seats. We worry about every sniffle, every warm forehead, and every single cough. We can’t stress enough how important it is to wash your hands and not come around Reese if you don’t feel well. Thankfully, everyone we know understands this and has been just as diligent as we parents are. Thank you to those who have told us they’re staying away because they’re sick or to not bring Reese to visit them. We understand and are so very grateful when someone tells us this. Thank you everyone for your help! 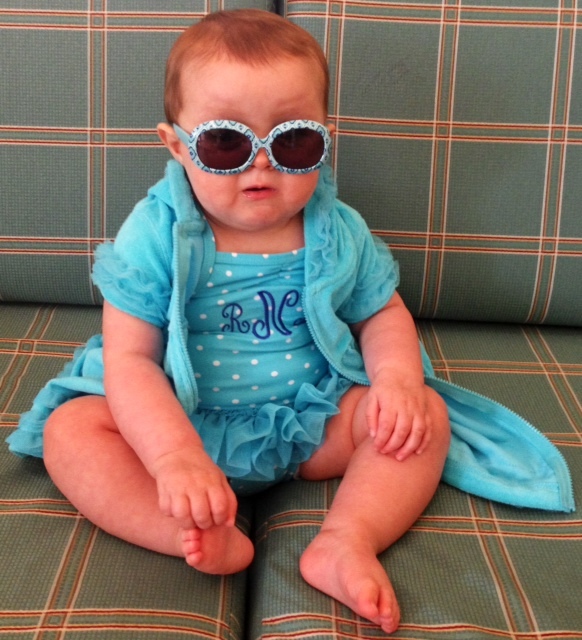 Now this week we have one last surgery for Reese. She has severe sleep apnea which causes all kinds of issues that she doesn’t need. The only way to remedy this for small children is to have her tonsils and adenoids removed. This surgery is scheduled for this coming Friday afternoon. Usually it’s an outpatient procedure for most children but our Princess Reese always likes to be different. Her doctor expects her to stay overnight in the hospital for one or two nights at the most. The surgery was delayed a few weeks because the surgeon wanted to consult with her other doctors and surgeons since Reese has specific medical issues that need to be adressed before they can proceed.This will of course not be as stressful as the open heart surgery. We’re still apprehensive as always but we haven’t been on pins and needles this time. Once your daughter has had her chest opened up and her heart stopped, all other surgeries seem minor. Yet we do realize that nothing is minor with Reese and we will always be in prayer for her. We ask for your prayers as we make another trip to Kosair Children’s Hospital. We pray for God’s understanding and comfort. 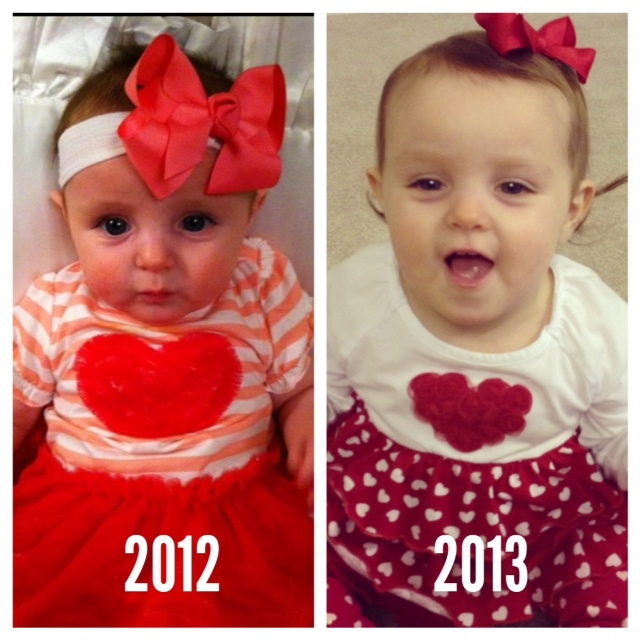 We pray our little girl heals from this as quickly as she did her heart surgery. We are so very thankful everyone’s support and prayers! No in all these things we are more than conquerors through him who loved us. For I am convinced that neither death nor life, neither angels nor demons, neither the present nor the future, nor any powers, neither height nor depth, nor anything else in all creation, will be able to separate us from the love of God that is in Jesus Christ our Lord. This Christmas season has been one of the most original our family has ever had. For the first time in as long as either Elizabeth or I could remember, we did not have anything to do on Christmas day. Our family celebrations were done the Saturday before Christmas, and Christmas Eve. So Christmas Day was to be a relaxing celebration at home. In fact, Reese turned 17 months old Christmas Day! That morning she received her presents from Santa and the rest of the day was planned as a slow and relaxing one in front of the fire watching Christmas movies. As we’ve learned from the last 10 months, our journey with Reese will always be unique and Christmas Day did not disappoint. Around 4pm that day Reese started crying like she was in pain. As we’ve discussed in this blog before, Reese does not cry. She can fuss at times when she’s hungry or tired, but otherwise she sheds no tears or cries out in any loud way. This time she did and she cried with such painful tears that hadn’t been seen since she had her heart surgery. We tried soothing her by walking or rocking but she kept crying and flexing her legs. We thought it could be a stomach problem since she had a stomach virus just a few days earlier and ended up at Kosair’s ER. We also thought she maybe had a Urinary Tract Infection (UTI). She’s had 2 before but they usually involve a fever which she didn’t have this time and she’s never cried like this. We decided to put her in the car and drive her around to see if she would settle. Reese absolutely LOVES riding in the car while starring out the window and just smiling and laughing. This time she kept crying and we knew this was different. So where do you go on Christmas Day when your child is sick? Why to Kosair Children’s Hospital of course! This would make our 3rd visit in 6 weeks to the Kosair ER, which is surprisingly around average us. The last 2 times we went we knew what was wrong and what she needed to get well. This time we were worried more than normal. Seeing her cry like she did was awful and we’re so not used to it. She cried the entire trip to the hospital which is about 20 minutes. Then cried another hour or so after we first got there. So all told, 2 solid hours of hearing our princess uncontrollably cry was not fun for us or easy on our nerves. Since we visit this ER quite frequently, the nurses know us and Reese by sight and even know Reese by name. The ER was very busy and in fact one nurse told us that Christmas Day is one of their busiest days of the year. They were taking kids back for triage then sending them back out to the waiting room to wait for a bed to open up so they could see the doctor. Thankfully, either because they knew us or most likely they just couldn’t stand seeing her cry, we got in a room immediately. After a couple of x-rays, and a catheter, they determined she had a severe UTI. They gave her 2 shots and sent us home on antibiotics. When the nurses came in to give her the shots, they said they would give them both at the same time in each of her her thighs. When they pulled back her leggings, they both commented on how she had perfect shot thighs! Basically that’s a cute way of saying she has chubby legs. It gave Elizabeth and I a good laugh. We now pinch her chubby legs and call them shots thighs. We didn’t get home from the hospital till around 10pm. We were so hungry when we left the hospital, we tried to think of some place that would be open on Christmas and finally realized Chinese! So we got home and chowed down on Chinese food while Elizabeth’s mom came over and helped put Reese to bed. As I said earlier in this post, this Christmas was original and Reese made sure to make it an adventure. Reese is doing much better now and is a very happy little girl. This was the first Christmas holiday since we learned of Reese’s diagnosis of MECP2 syndrome. Last year we were enjoying our little girl’s first Christmas, not knowing that this Christmas we would be looking back at the last year with such sadness, joy, and awe. We’re sad because our expectations for our daughter our very much different than just a year ago. Last year we dreamed of her crawling or running to the tree this Christmas. Now we just pray she one day may crawl or walk. We’re joyful because our daughter is with us and we’re so blessed with all God has given us this past year. We are in awe of God’s glory. He is the one true sovereign God who gave us the most precious gift in his son, our savior, Jesus. We all fall short of God’s glory every single day, but his grace through his son is what we can always depend on. It’s the greatest gift ever given. May we give him the glory in everything we do. I leave this long blog post with some pictures of our family this Christmas season. Hope everyone reading this had a Merry Christmas and a blessed New Year. God is good. My little sister (Brenna Wiles) in KD was in a car accident 12/10/12. She had multiple injuries and has already had a couple of surgeries. I know that prayer is powerful and I ask you to please keep her and her family in your daily prayers. She is such a beautiful and precious young woman who I know will overcome this storm. Her little boy Cole was not hurt–praise God. You can follow her updates on CaringBridge. Thank you for keeping her in your prayers. Truth–I broke down crying when I was suggested that I should look into getting Reese one of these. So many things went thru my head–huge equipment, she is not going to walk, screams special needs… However, if it’s going to help her learn to walk–I’m game. Thank goodness Reese’s physical therapist wasn’t the first one to mention this to me because I’ve broken down on her enough… I’m sure she was thankful I held my composure when she suggested a gait trainer. We believe this is going to be covered thru some of the services Reese is receiving, which would truly be a blessing since this would cost approx $2,500. Of course, Reese will need a cute UK outfit! Lastly, I will probably get Reese a baby doll–what’s a Christmas without a baby doll! I never thought I would have to ask the therapists what would be ideal toys for Reese for Christmas. We want to get her things that will help her develop and met her full potential. Getting Reese just any toy isn’t ideal because she has a tons and doesn’t even play with them. Reese loves to read and we have tons of books. 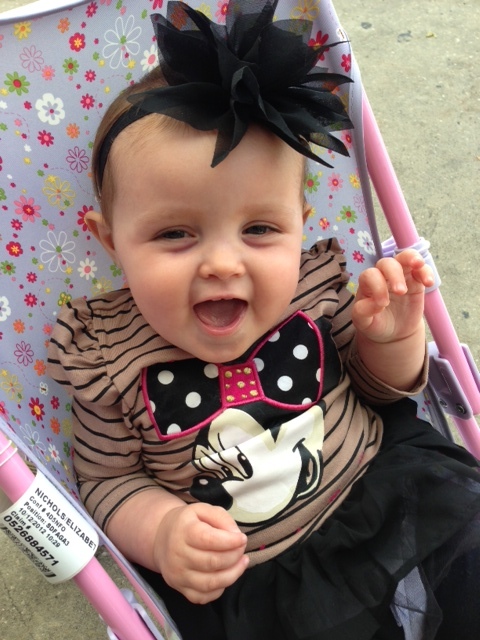 Reese also loves music so I am looking for a musical/sensory toy–therapist is suppose to send me some ideas. Baby Einstein Aquarium–has lights and music! Others have asked what they can get Reese, which is so nice because we can give them suggestions that would beneficial for Reese. Matilda Jane gift cards for her spring/summer wardrobe! Well, I wrote this blog post on October 18th (day before we headed back home from Disney) and I’m just now getting around to posting…. I wonder if there will be a day that I wake up and I am not reminded my Reese McClain is different. If I stay at home all the time with Reese–I feel this could be achieved but not possible. As everyone tells me how precious Reese is (that has no idea her circumstance) I tell myself: Reese is adorable–must be true because they have no idea anything is “different” with Reese. Then there comes that time when you’re “reminded” in the airport with a girl the same age as Reese who is walking, talking and feeding herself grapes. So you’re sad, cry, pray and receive a new day, new grace from God. Disney was fun but I was reminded often. Little feet walking, little ones responding and Reese sometimes responding. Those times she responded I will hold close to my heart and play them over and over as it keeps me alive. She laughed and laughed at the goofy bus driver as he welcomed us and told us the stops we would be making before getting to Old Key West Resort. It doesn’t stop a hurting heart but God does and will continue to provide comfort. I am so blessed to have so much encouragement and loving support BUT I still want to know why. Wouldn’t you? Imagine your child having a disability. How would you respond? What would you think? Would you think about their future? As I write this post I’ve looked back on the facebook comments I received when I wrote about seeing the little girl at the airport. I appreciate the comforting/encouraging words. No one will understand/experience “your pain” in any situation. I’ve been told my situation could be worse. This is true but that comment had come from mothers of healthy children. I’ve been guilty of saying “that’s horrible situation for X” but unless you’re in the situation you do not experience the continuing heart ache. 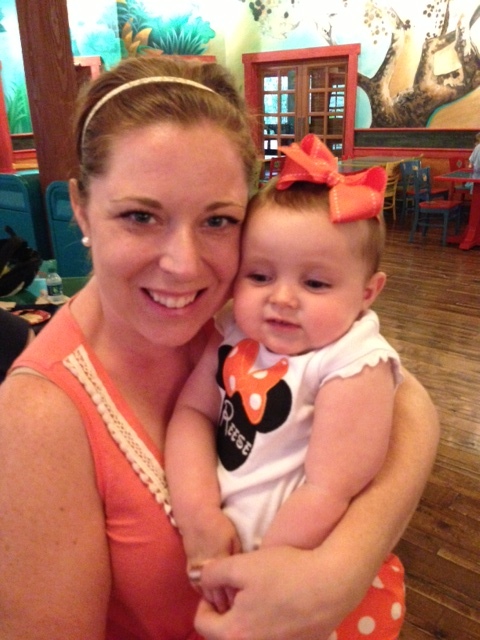 Hope you enjoy some snapshots from the Happiest Place on Earth! I am what my wife, family, and even co-workers would say is a very laid back person. I get excited for vacations, UK basketball games, and eating or cooking barbecue. I stress over very little and I only get mad at left lane drivers (looking at you Indiana) and windows computers (please just get a Mac, your excuses are becoming annoying). Ever since Reese came into our world, my stress still hasn’t jumped as one would think, but my worries are different. For years I have made fun of helicopter parents. You know, the ones who follow their child from room to room and are always within arms reach. They constantly worry over every tear, every cry, and every runny nose. They strap them to leashes when they’re out in public and won’t let them play anywhere or with anything that could possibly get the child hurt. I have become the helicopter parent. At least from the worry and medical sense. I try to ask everyone who visits Reese if they’ve washed their hands, I check on her constantly while she sleeps, and I pray no one I come in contact with is carrying some super bug that could hurt my precious girl. Reese is medically fragile with a capital F. Sure, she’s gotten healthier and stronger the last 6 months. It’s easy to see how well she’s progressed and think everything is going to be fine. Many people love to tell Elizabeth and I this. Sometimes I even start to believe it. Yet it only takes one look at a facebook group we belong to of parents who have children with her genetic disorder, to understand things might not ever be normal. Their are heartbreaking stories of the epilepsy, the hospital visits, and the many therapies it takes for our children to develop. Just last Friday, I received an update on a 5 year old boy who has the same genetic disorder of Reese who passed away. Just reading his story had me crying at my desk. Last night Reese started getting fussy and had lots of mucus in her nose and we used our suction machine to help keep her clear. Our big worry is it getting into her lungs and pneumonia returning. We have suctioned more mucus out of her in the last 12 hours than we have in months. She’s very fussy but has no fever, yet we can tell she doesn’t feel well. This is where we had to make a decision, do we go to our regular AMAZING pediatrician or take her to emergency room? With this much mucus, we decided a trip to the ER was needed to make sure everything was ok. We’ve been down this road before and waited for a fever to come and when it finally does, it jumps quickly and without warning. So off to Kosair Children’s Hospital we went. As I drove her there, I was reminded of a commercial we see in our area for Kosair. It’s on constantly and it’s of an elderly man who went to Kosair often when he was a little boy and grew up to be a doctor. He ends the commercial with “I’ll bet I’m one of the oldest Kosair kids around.” I’ve seen that commercial a dozen times and every time I’m reminded, I have a Kosair kid too. I never thought my life would be that way. Spending weeks at a time in a children’s hospital was so foreign to me. I’m a control freak and I have always hated hospitals. These days I walk into an ER I’m no longer intimidated by the machines, nurses, and doctors. Today I walked in and within 10 minutes of triage the nurse said, “Well you sure know your daughter’s details.” As I write about it now, I’m amazed at how God has humbled me. He’s reminded me that it’s not about me and I’m capable of way more than I ever thought. Thankfully, our ER visit was a short one. Reese has an upper respiratory infection along with an ear infection. She got another x-ray and some suction at the hospital. We’re now home with antibiotics and lots of rest. We pray it doesn’t get worse and this infection passes. We pray for healing and put our trust in God’s plan. May his glory always be revealed in everything we do.